yet in a great location to explore in all directions. Explore many picturesque spots within two major river watersheds, providing opportunities for a variety of water and snow activities as well as hiking, biking and snowmobiling. Escape into nature around Belwood, Elora, Luther Marsh and Rockwood. 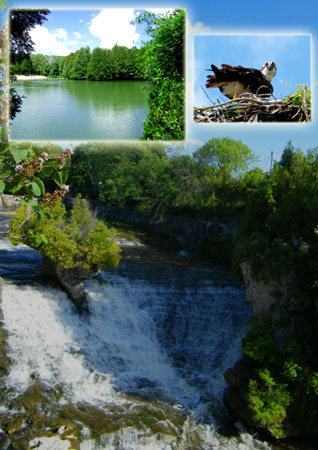 How about a bike ride along the Elora-Cataract Trail? Or a hike on the Bruce Trail? Forks of the Credit Provincial Park as well as Island Lake, Upper Credit, Terra Cotta and Belfountain Conservation Areas are all just a scenic drive away. The avid golfer will find a number of attractive golf courses in the area. Explore the tourism info links on the right or contact us for a list of links and directions to some great golfing opportunities. Many talented artists reside locally, studio tours are offered at various times. Culture and art abounds at local studios, in town or at the Alton Mill and the Elora Arts Centre. Why not catch a performance at the Orangeville Theatre? If you love to peruse interesting and unique shops, there are lots of fabulous spots around. For yet another perspective on beautiful southern Ontario, we're on the doorstep to the Amish and Mennonite communities; St. Jacobs is within easy reach, too. Visit these sites to explore the endless opportunities, for info on events and maps as well. These are external websites, we are not responsible for their content. things to do and see year-round. Come and find out for yourself! the Elora Falls and an Osprey nesting nearby.